It's been some time since Firestar enjoyed a taste of the limelight. Whether she's been running with the Hellfire Club, the New Warriors, Spider-Man and Iceman or the Avengers, it seems like she's always been an extra: seen but not heard. That's something of a shame, because her personal story is surprisingly deep and fleshed out. 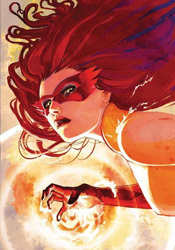 Under writer Sean McKeever's hand, Firestar's tough luck takes center stage, shifting her from an also-ran that most readers remember as one of Spidey's Amazing Friends into a sympathetic figure who stares down terrible personal adversity every day. Like most heroes with a secret identity, she juggles an active private life with regular costumed patrols – but her powers, for all the good they're doing, are also slowly killing her. Having never developed immunity to the microwaves that drive her abilities, she's developed a cancer that saps her strength and willpower each day. It's a tragic turn for a character that's usually so cheery and upbeat. Despite being handed such a complicated, multifaceted situation, McKeever never takes it anywhere. Cassie's struggles with her identity and the effect it's having on her health are the focal point of the story, but she finds no solutions or personal breakthroughs this month. Really, we're just watching her deal with the situation day-to-day and eavesdropping on her depressing social life. She feels uncertain about her place in the world, and despite the assurances of her friends and family the readers don't get any reason to believe she's wrong for doubting herself. Is it worth literally killing yourself to stop a couple joyriding teens or pull a few cats out of trees for old ladies? Most one-shots don't waste a lot of time in getting right to the meat of the subject, but Firestar seems content standing perfectly still and mumbling to itself.